FA Cup final referee Jon Moss is a "political pawn" whose appointment does not make any sense, according to former Premier League official Mark Halsey. Moss will officiate Aston Villa v Arsenal at Wembley on 30 May but Halsey claims the 44-year-old "has not had a particularly good season". Halsey says Mark Clattenburg should take charge and wants the Football Association to review the process. "I'm amazed that they've not given him the final," Halsey said on Wednesday. "I would imagine that Jon Moss will feel a little bit sheepish that he doesn't really deserve it and Mark Clattenburg does." Halsey alleged in a blog post that certain figures at the FA do not want Fifa-listed referee Clattenburg to officiate at Euro 2016 and are seeking to project the message that the 40-year-old "isn't our top ref". "I've got nothing against Jon, he's a good lad, but I think he's a political pawn," Halsey told BBC Sport. "I know that certain people don't want Mark refereeing in the European Championship. It's quite obvious they want Martin Atkinson to go ahead of Mark Clattenburg." Clattenberg and Martin Atkinson are currently the only English referees in the top tier of Fifa officials. BBC Sport contacted the FA and referees' body Professional Game Match Officials Limited (PGMOL) over Halsey's claims but neither was prepared to respond directly. The FA says its selection process took into account Moss' performances and experience and that the appointment had been well received by the refereeing community. PGMOL stressed that the FA was solely responsible for the appointment. Referees can only take charge of one FA Cup final in their career and are chosen by a panel of former officials. 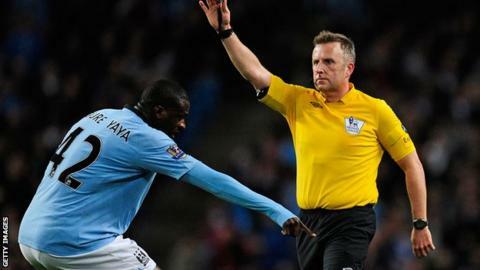 Atkinson refereed the 2011 final between Manchester City and Stoke. "You are always looking for your best man available to referee that prestige game," Halsey added. "It's no disrespect to Jon, but is he the best man? Has he been given a big game by the PGMOL? The Manchester derby, Man United v Liverpool, Man United v Chelsea - has he been trusted in those games? No, he hasn't. "How many times has Mark done massive games? He's done the Uefa Super Cup this year, big Champions League games and earned plaudits. It just doesn't make sense." Sunderland-born official Moss said the FA Cup final would be "the biggest game I will ever referee" when his appointment was confirmed on Tuesday. "I'm not doubting or slagging him off," Halsey continued. "I try to help [referees], offer constructive criticism. "People say I'm putting pressure on Jon. It's the FA that's done that. The FA has put extra pressure on that game." Clattenburg made headlines earlier this season when he was dropped from officiating for one weekend due to two breaches of protocol.